This time of year, I search for recipes that allow me to make use of dyed hard-boiled eggs. Ever since I was a child, I’ve loved the tradition of dying eggs for Easter. Plastic eggs, full of sugary sweets were never a disappointment to find (unless ants had found them first, of course), but my preference was always for the dyed hard-boiled eggs. Damp with dew and heavy in your palm, they seemed like jeweled-tone assurance that spring was here. Yesterday, my daughter and I dyed a dozen eggs together. She was more into putting stickers on the eggs then the dying itself, but the project was a success in that no eggs were lost to clumsy fingers. 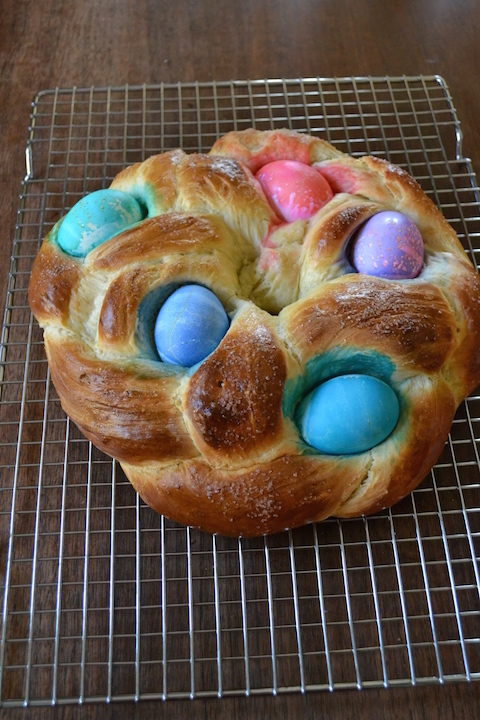 I placed a little over half the eggs in the refrigerator for safe-keeping until Sunday’s hunt, but the rest went to make this Easter bread. 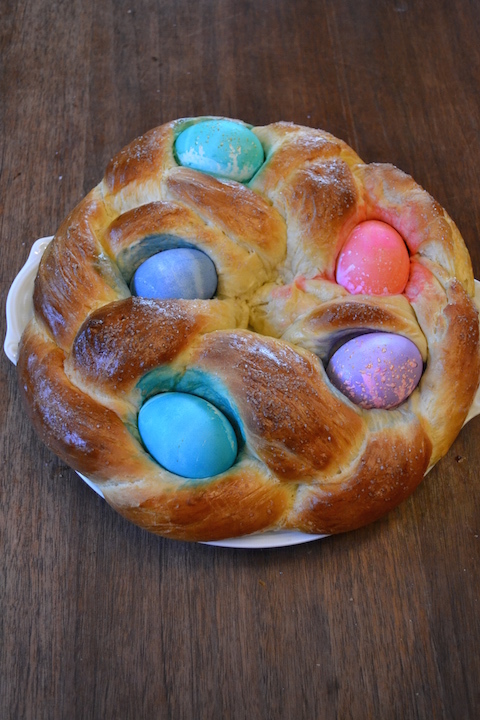 I’ve never made Easter bread before, but the braided loaf with brightly-colored eggs tucked inside seemed like a dish that would delight both the young and the young at heart. 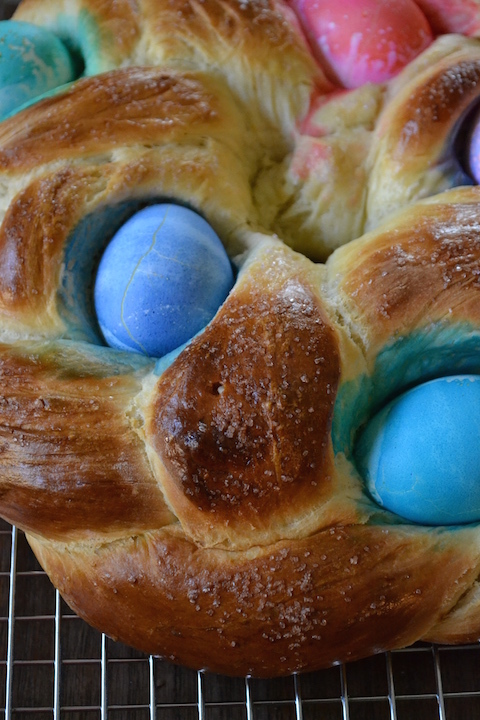 Traditionally made in Greece and Italy around Easter, a quick search on the internet reveals that the bread’s popularity is not limited to the Mediterranean. And for good reason. Soon after pulling it out of the oven yesterday, we decided to do a little taste test and quickly decimated a third of it. Our friends with two little boys down the street, gobbled up another third, and the remaining third sits, with full knowledge of its fate, in the refrigerator. It will not last through lunch. The dough for this recipe, tweaked to my taste with lemon zest and almond extract, will be in my repertoire for a long time. It’s a beautiful dough and for a home-cook the quantity made is manageable. It will cause your stand-mixer to wobble, but unlike other recipes for sweet dough will not send it thumping towards your counter’s edge. Once you add all the ingredients, be sure to let the mixer run for the full five minutes for best results. I spent a lot of time researching whether or not to use hard-boiled eggs or uncooked eggs for the bread itself. Some recipes suggest using hard-boiled eggs while others recommend uncooked eggs that will cook as the bread cooks. After devoting far too much time to figuring out what approach was historically correct, I realized that I really had no interest in eating the egg no matter how O cooked it and decided to use the hard-boiled eggs that I already had on hand. In the name of science, I did break one of the twice-cooked eggs open and decided in one whiff that I certainly did not want to eat it. To that end, urge your guests to remove the eggs as they slice the bread and discard them. Happy Easter! Adapted from Melissa Roberts’ recipe featured in the April 2012 Bon Appetit magazine and found online at Epicurious at here. Add the flour, salt, and remaining ¼ cup of sugar to the bowl of a stand-mixer fitted with a bread hook. With the mixer running on medium speed, stir in the milk and egg mixture and beat until combined. Add the lemon zest and mix on medium speed while you add a tablespoon of softened butter at a time. Add the next tablespoon of softened butter only when the first has been incorporated. Once all the butter has been added, increase the speed to medium-high and beat for 5 minutes or until dough is smooth and soft. 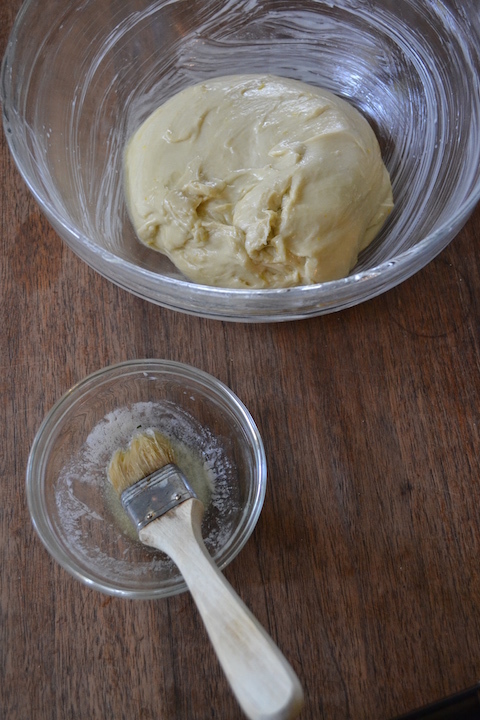 Brush some of the melted tablespoon of butter all over a large bowl. Add the dough and brush the remaining melted butter over the dough. Cover with plastic wrap and let rise for 1 ½ hours until it is double in size. Preheat the oven to 375 degrees F and line a baking sheet with parchment paper. Lightly dust the counter and the dough with flour. Turn the dough out on the counter and divide it into three equal pieces. Roll each piece into a long strip – about 15 inches. Join the ends of the each strip together and braid. You can make a long loaf or twist the loaf around and join the ends to make a wreath as I have done. If making a wreath, place a cup in the center of the wreath to keep the center open as the dough rises. 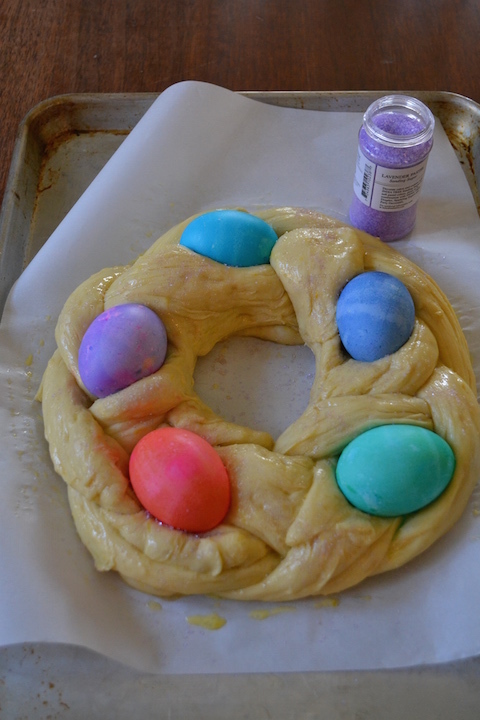 If using dyed eggs, tuck them into the braids. Cover the dough loosely with plastic wrap and let rise in a warm, draft free place for 1 hour. When ready to bake, prepare an egg wash by whisking the remaining egg and 1 tablespoon milk in a small bowl. 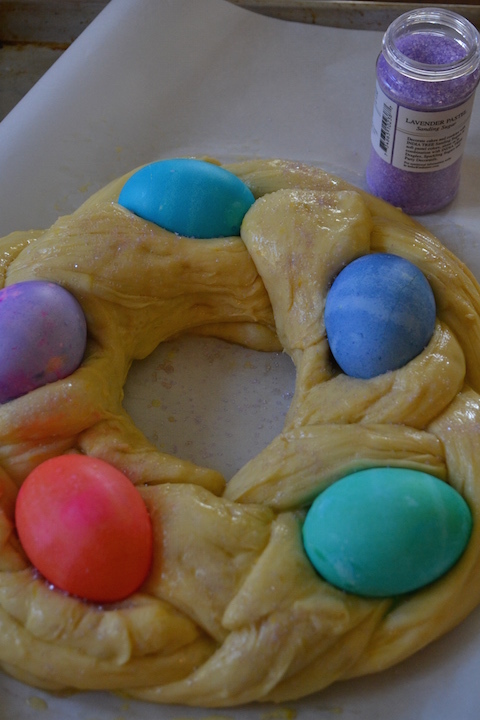 Brush the dough with the egg wash being careful to avoid the eggs. Sprinkle with sugar if using. Bake for 25 minutes until the dough has an internal temperature of 190 degrees F and is golden brown. Cool on a wire rack. The eggs are solely for decoration and should be removed as you cut slices. Happy Easter. This looks so cool! What an great idea. Thanks for sharing! Thanks! It not only looks beautiful, but tastes delicious. I love thinking of you and sweet I dying eggs–what fun!